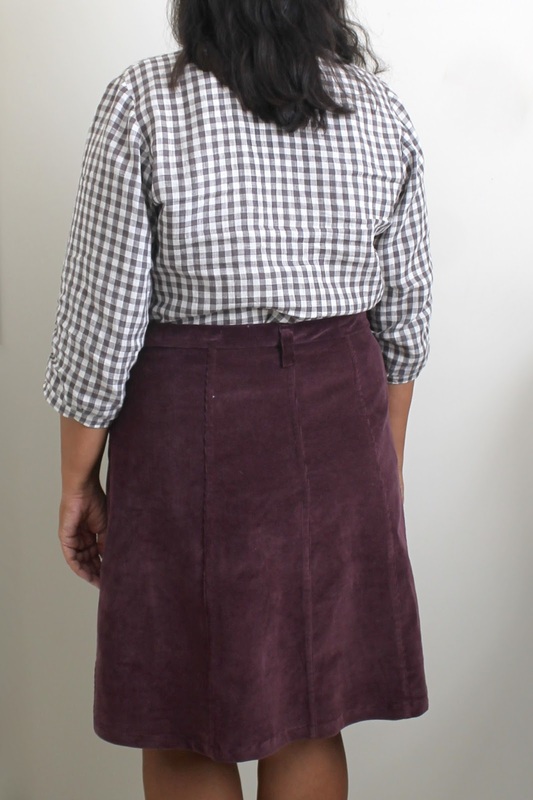 I've worn my Tillery skirts quite a lot since finishing them last month. Every time my sister-in-law, A, has seen me wearing the denim one, she has commented how much she likes it. Turns out that she had been eyeing similar skirts in stores, but that they were all too short for her taste. So I offered to make her one and she suggested that it be her birthday gift. I had just enough denim from my skirt left over to make hers. It is a cotton/poly blend that I got on sale from Joann's with the intentions of making pants. It's quite drapey for denim, which I think is actually very nice for this pattern. I sewed up a size 6 graded to a 10 waist based on A's measurements. It was quite enlightening to measure her, actually, as I would have assumed she was a straight size. She is slim, and looks very proportionate - the type of figure that I would assume has it easy fitting RTW sizes. Not so at all, though - because of the difference between her waist and hips, she often has trouble with gaping waistbands. It was a pleasure to sew this for her because I could tell from our first fitting, how grateful she was to have a garment that fit her exactly the way she wanted. The sewing of this garment was straightforward, as I had sewn it up twice before. I was working from the final version of the pattern, though, which has notches on the skirt panel pieces (the tester version did not have notches), and I cut some of the notches slightly too long, thinking that I had a 5/8" seam allowance to work with. I neglected to take into account that the flat-felled seams meant that some of the seam allowances would be visible. Luckily I was able to make it work, but if you are making this pattern, be sure to be sparing with fabric when you cut the notches - I wouldn't cut them wider than a scant 1/4". Once again I used Dritz Heavy Duty Snaps and found them easy to work with. I was unable to put belt loops on this one because my sewing machine just would not sew them on. 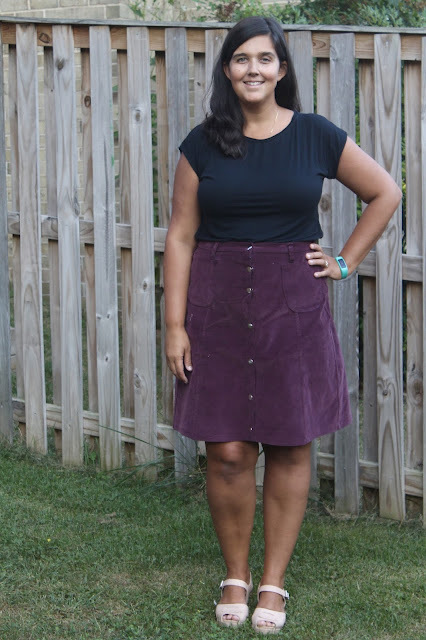 I couldn't figure out what the problem was, as I had made myself this exact skirt in this exact fabric, but then I realized that I had accidentally interfaced both waistband pieces. Oops. So the waistband is extra-firm, but A doesn't mind. I also added a hidden snap between the second and third snaps from the top - if you look carefully in the photo above you can see where it is. There is just a bit of pulling in that area, so I probably should have graded the pattern lines a bit differently, but it looks good on and doesn't feel tight on her. 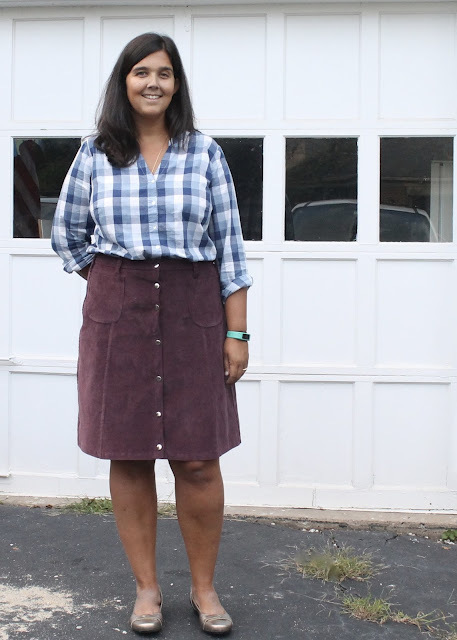 Since I got this skirt sewn up, I've been sewing up a lot of knits for my kids, and haven't been successful in getting photos of them, thus the month-long blog silence. I am hoping to cut a new pair of jeans for myself after I finish the pile of kid knits on my sewing table, so hopefully I'll see you back here relatively soon. The skirt I'm showing off today has already become a wardrobe staple. 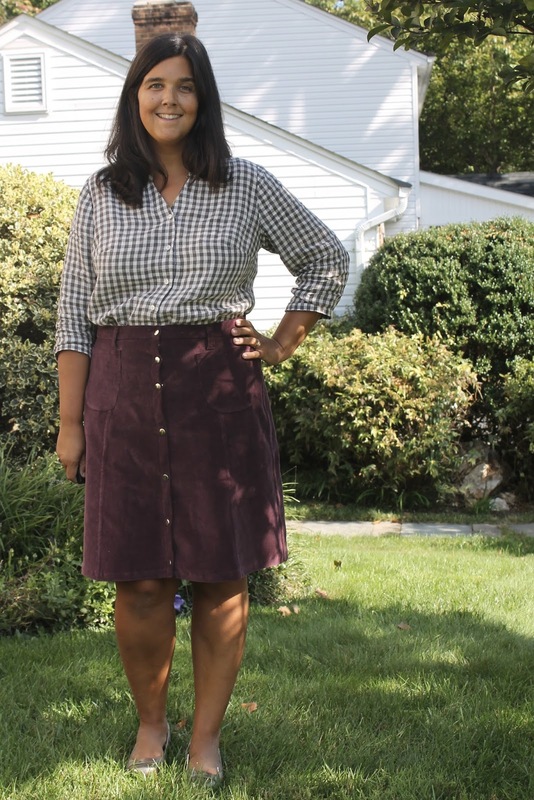 This is the new Tillery Skirt from Blank Slate Patterns, which I tested earlier this fall. I've worn it at least once a week since completing it, with flats and a t-shirt or a button-down. And although I'm not dying for the weather to cool off, I am looking forward to wearing it with boots once the temperature drops. The fabric calls for a non-stretch woven, but I really wanted to use this corduroy that has been hanging out in the stash since we lived in Tbilisi. It's a stretch cotton corduroy, but is fairly stiff and stable, so I figured it would work ok (and it did). I sewed a size 14 according to my measurements, and ended up taking a wedge out of the waistband (1/2" at the top, 1/4" at the bottom), doing a sway-back adjustment and adding 1.5" of length to the knee-length view of the pattern (I am 5'8"). 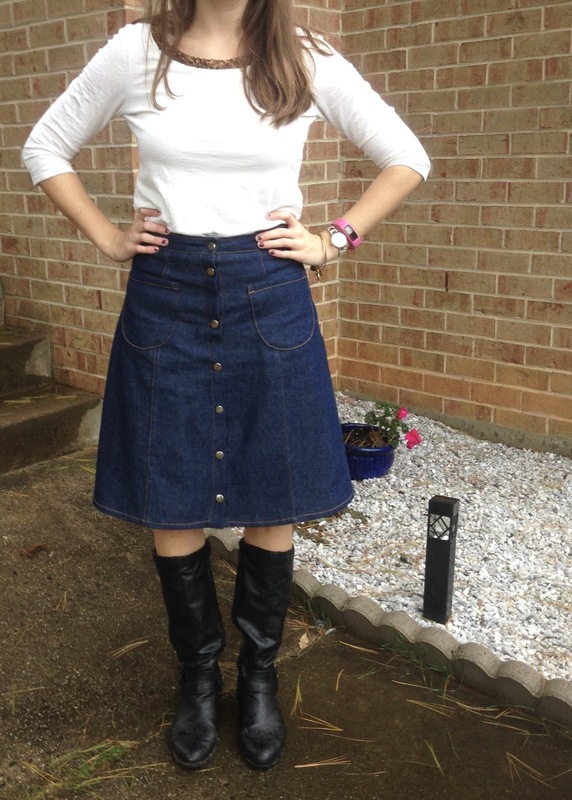 The skirt has three views - mini, knee-length and midi. It features a snap-front, seven flat-felled seams, pockets and five belt loops. 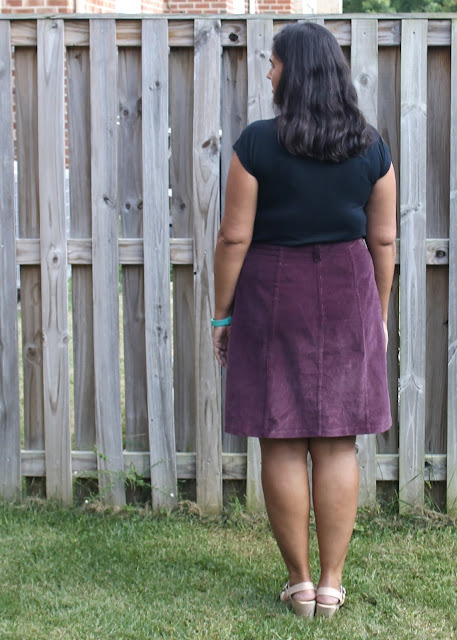 The skirt is a pretty quick sew despite all the flat-felled seams. I was also pleasantly surprised at how easy it was to install the heavy duty snaps (I used these). I changed up the suggested snap placement a little bit to provide more snap coverage at the fullest part of my belly, where the placket wants to gape open. The pattern is designed to sit at the natural waist, which I was a bit skeptical about, as my natural waist is super-high and I never wear anything there. 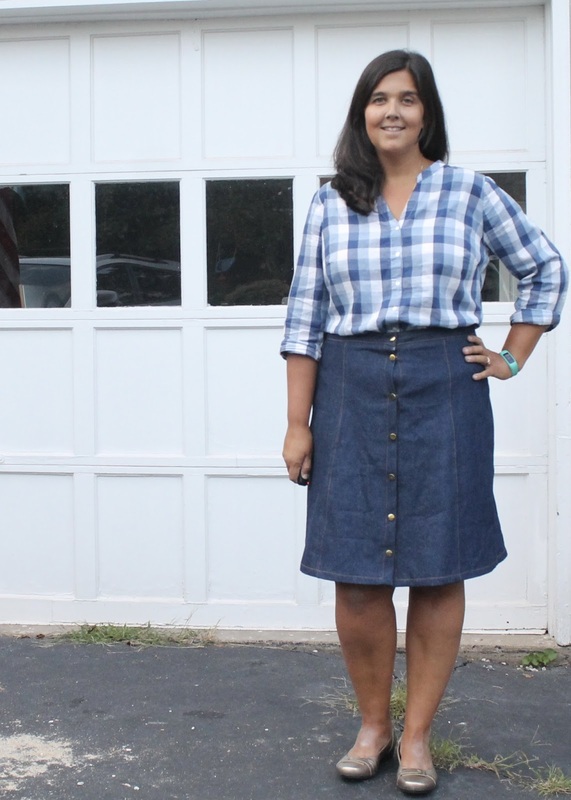 But I actually really like wearing the skirt with a tucked-in button-down. 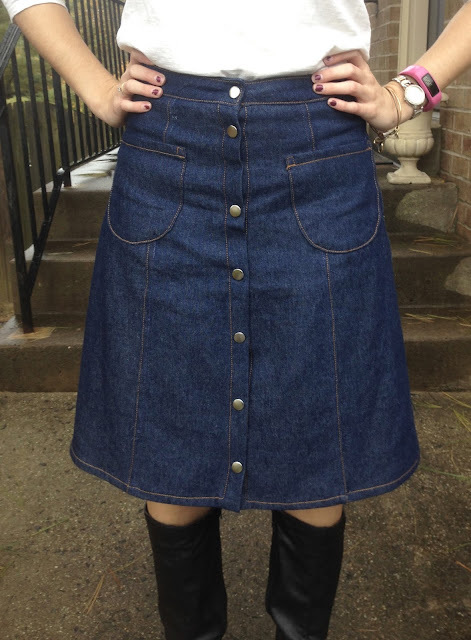 After completing the corduroy one, I made a denim one, which must have gotten stretched out during sewing because it sits considerably lower than the first skirt. And I find I don't wear it nearly as often. 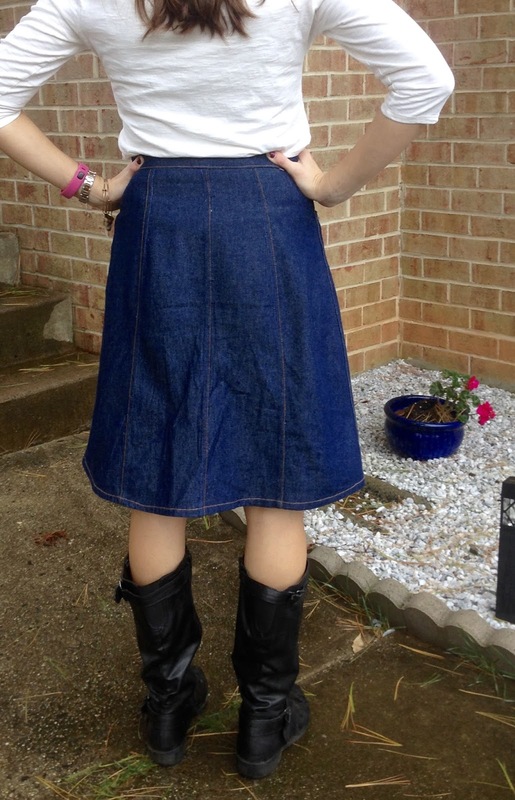 I also messed up the snap placement on the denim skirt, and it gapes a bit towards the top of the placket. 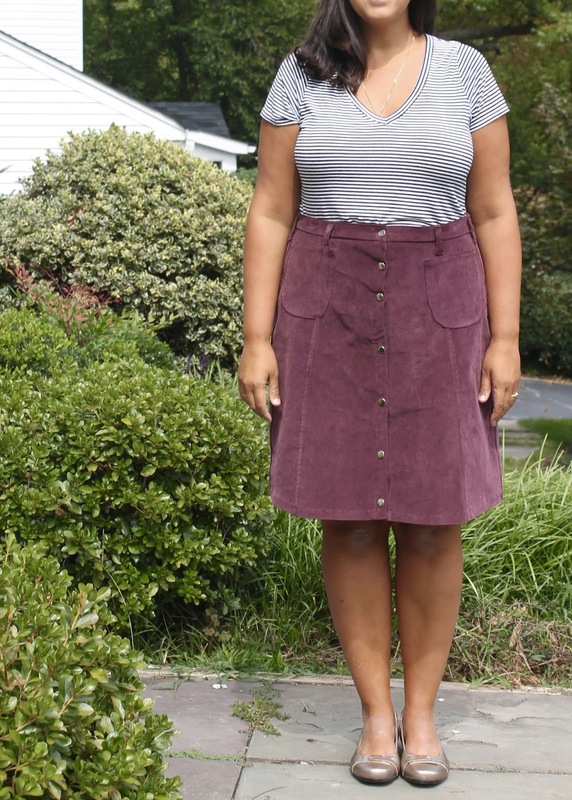 I keep meaning to sew a snap on the inside, but honestly I will probably end up donating this skirt. The purple one, though, is a winner. Here are a few more photos of it.